Get ready for a Melissa McCarthy you haven't seen before. Last year McCarthy was seen more on the small screen as Sean Spicer than she was on the big screen, but she's coming back in a big way in 2018. The most intriguing of her many upcoming projects is Can You Ever Forgive Me?, which places her in a dark, dramatic role as real-life scam artist Lee Israel. Directed by Marielle Heller (Diary of a Teenage Girl), the film centers on Israel, a failed writer who made ends meet with a literary scam forging the words of famous dead writers, forgeries that were then sold for a fortune. This is a very different McCarthy, her comic sensibilities taken down a few notches. Heller seems to have found a way to redirect McCarthy's typically manic energy, while Richard E. Grant seems to be picking up the comic slack. 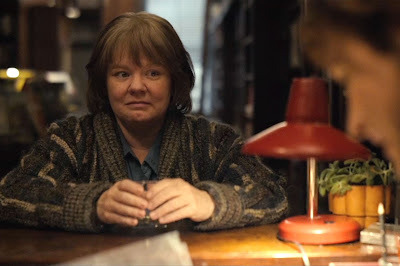 Also starring Jane Curtain, Dolly Wells, and Anna Deavere Smith, Can You Ever Forgive Me? opens October 19th.